This was to be the very last day we were going to spend at Banff. 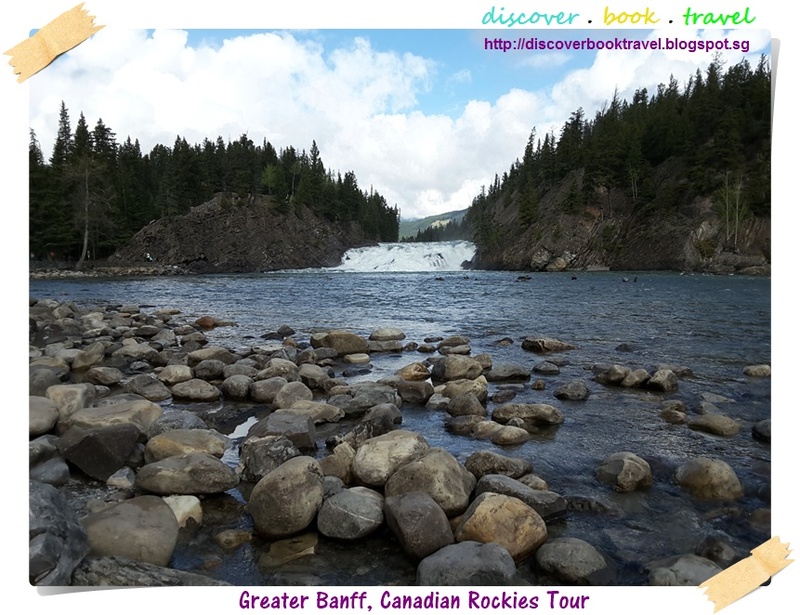 The past 2 days were good and relaxing for us while we took our time to explore downtown Banff, but today, our focus would be to explore the outskirts of Banff Town. The Brewster coach was at the Elk + Avenue Hotel this morning to pick us for the exploration of the greater Banff area, and to continue on with the rest of the trip towards Calgary. Right after leaving the Elk + Avenue Hotel, our first stop was the Bow Falls - which made sense, because it was so near to downtown Banff - in fact, it was within walking distance of downtown Banff! Bow Falls although with a certain amount of renown, is a waterfall of rather small scale that pales in comparison to the other scenery that we had encountered in the Canadian Rockies such as the Athabasca Falls in Jasper National Park and the Natural Rock Bridge in Yoho National Park. It is nevertheless still pretty amazing if only you have the time to hike along the trails along Bow Falls. Notice the people at the cliff face on the left hand side of this picture? Along that cliff face is a staircase which would bring you to the hiking trail to observe the Bow River upstream before the falls. Bow Falls is still quite a pretty sight despite its lack of height and magnitude, especially when on a clear day, you can see the mountains in the background. 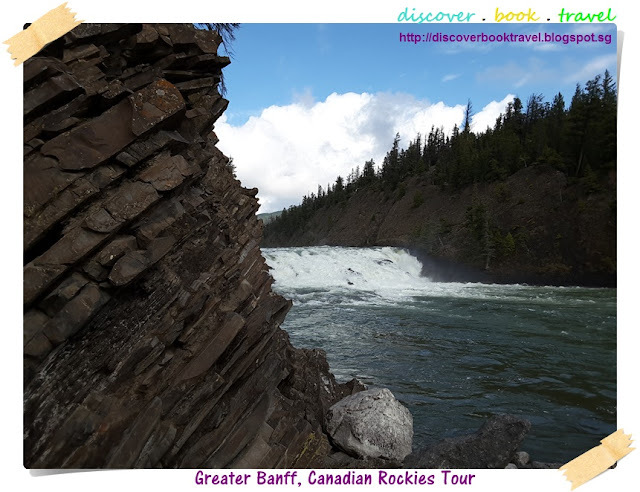 Our Brewster coach dropped us at the Bow Falls only for a short photo opportunity with little time to spare, so we could only rush up to the top of the hiking trail to snap this upstream photo of the Bow Falls. But definitely explore the trail if you have time! That's how far up the trail we could have climbed if only we had the time! The cliff face at the Bow Falls had a rather interesting rock structure that makes a great photo together with the falls. Just a short distance downstream from Bow Falls, the waters in the Bow River is a picture of calm and serenity. That's how little energy the Bow Falls had generated - you won’t even know there was a waterfall upstream if you had looked at these pictures by itself! 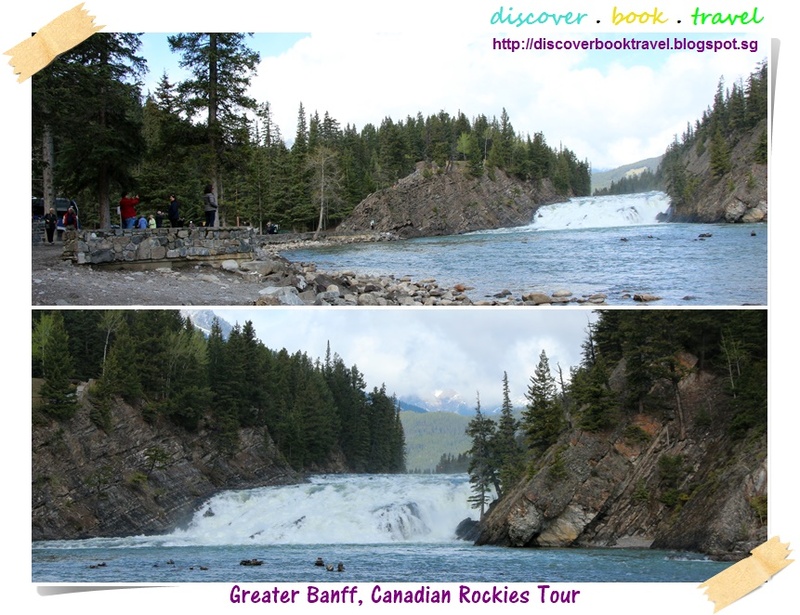 A short distance from Bow Falls was Surprise Corner, a scenic lookout point with views of the majestic Fairmont Banff Springs, sister of the luxurious Fairmont Chateau Lake Louise. The Surprise Corner was so named because as you travel along Tunnel Mountain Drive, the sharp turn at the corner reveals a sudden view of the Fairmont Banff Springs nestled within the Sulphur Mountain. Across the parking lot is the viewing platform with the best views. At the viewing platform at Surprise Corner. Fairmont Banff Springs and the Bow River below it. 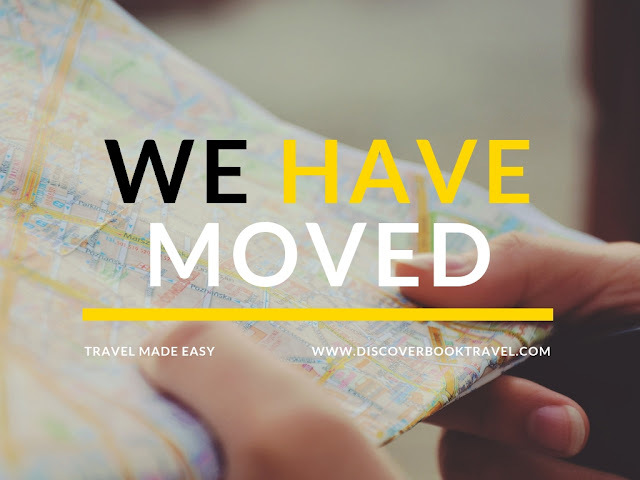 In fact, if you want to explore more of the Bow River, staying at the Fairmont Banff Springs will be the best arrangement. Beyond the Fairmont Banff Springs, there looked to be another accommodation within the same mountain, although I have no idea what it was. The Hoodoos are some of the weirdest rock formations in the Canadian Rockies, and are visible at Banff and Yoho National Parks. Fashioned from layers of shale and sandstone, these missile-like rock formations are carved out from the earth through a mixture of erosion, wind, rain and surface water. They are usually capped by a hard-rock top which protects the lower parts from further deterioration. Mount Rundle and the Bow River in the background as we approached the Hoodoos. And in the distance, the Fairmont Banff Springs which we were at this morning. 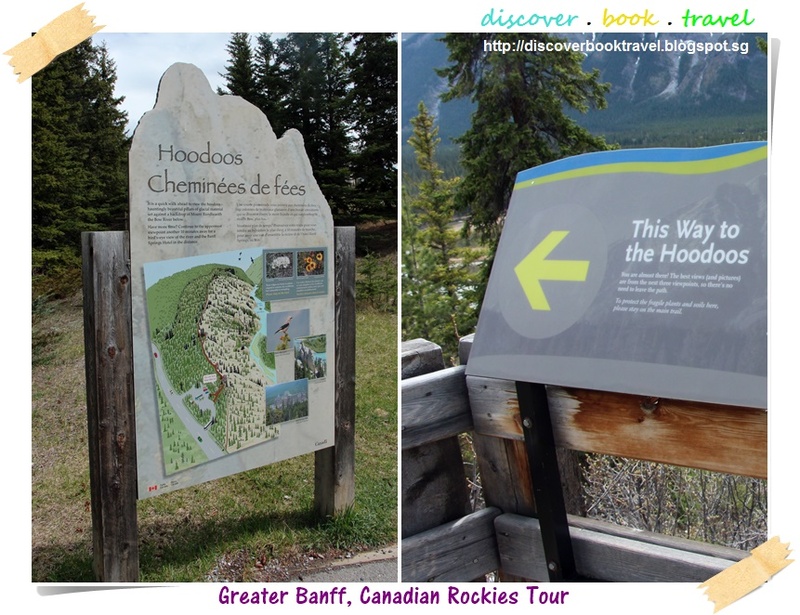 Finally, a short walk along the hiking trail brings us to the best views of the Hoodoos. No one ever knew why they were called the Hoodoos, except that legends surrounding these rocks leaves no imagination over the years. At the Hoodoos, the view of the Bow Valley is outstanding. 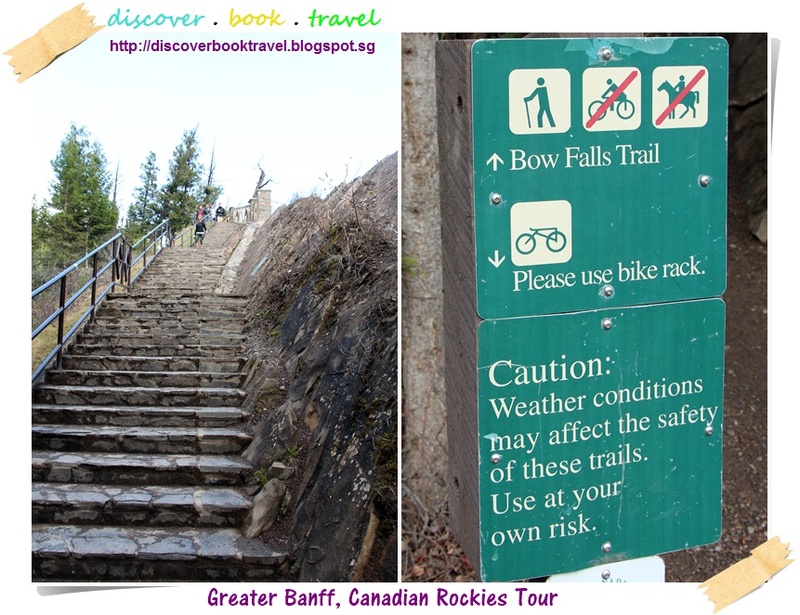 We were supposed to go to the Banff Gondola, but we were brought to Mount Norquay Viewpoint instead. Over here, the scenery is free. Unlike the Banff Gondola, we need not pay for admission tickets. At Mount Norquay viewpoint, it looked as if we had the world at our feet. We could look back at Banff Town where we were staying at just this morning. The Trans-Canada highway, the main artery in the Canadian Rockies cuts across horizontally and feeds traffic into Banff Town vertically. The Vermillion Lakes are to the right with Mount Rundle as its background. Sitting on these chairs gives you the best experience, although it felt that we will tumble down into the valley anytime. If you are lucky, you may find some wildlife for company. Join us next as we embark on a helicopter ride above the Canadian Rockies!